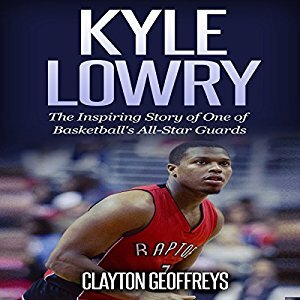 I am ecstatic to announce the release of my narration for the Kyle Lowry biography, written by Clayton Geoffreys! This is part of his popular Basketball Biography Books series. In this reading, you will hear the inspiring story of NBA All-Star and Cardinal Dougherty alum, Kyle Lowry. This audio trip includes his story from being a young kid traveling around Philly playing pickup basketball, to becoming one of the Philly Catholic League’s best players. Born, raised and residing in Philadelphia, PA, I am honored to bring this story from the pages to your earbuds. If you’d like to review a copy, I can GIFT YOU the audiobook. Contact me through Twitter or Facebook for details. You can pickup a copy on Audible (http://www.audible.com/pd/Bios-Memoirs/Kyle-Lowry-Audiobook/B01N1ZA41L?source_code=soc_twi_nr) or on iTunes (https://itunes.apple.com/us/audiobook/kyle-lowry-inspiring-story/id1192830757).